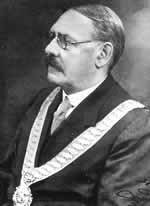 Frank Rishworth was born in Tuam, Co. Galway, and was a student of Professor Townsend in Galway, graduating in 1898. After graduation, he worked as a railway engineer in the United Kingdom prior to his appointment as a lecturer in the School of Engineering, Giza, Egypt. He resigned from that post in 1910 to succeed Professor Townsend in Galway. As the University was expanding in the early part of the 20th century, Rishworth designed and supervised the erection of a new engineering building on the campus, which is still in use to this day. Like his predecessor, he had a deep interest in teaching and the welfare of his students. In 1925, he took a leave of absence from the University and was appointed as Chief Civil Engineer to the Shannon Hydro-Electric Scheme. A visionary and innovator, his earlier influence with Thomas McLaughlin was seen as one of the prime motivating factors of the scheme in the first instance. On completion of the scheme, he returned to the University but he continued to consult with the government and local authorities on a variety of issues. He was particularly active in the areas of water supply, sewerage schemes and traffic. He retired from the University in 1946 and died at his home in Dublin in 1960.